An editor-in-chief of a State-run newspaper in the Xinjiang Uygur Autonomous Region was expelled from the Party and the post for making "groundless comments" on the nation's major decisions, making him the first Party member punished under new Party rules. Zhao Xinwei, the editor-in-chief of the Urumqi-based Xinjiang Daily, was punished for severely violating political disciplines and rules, said an announcement on the website of Xinjiang's discipline inspection commission on Sunday. Zhao allegedly made "groundless remarks" on some major decisions. He has also published opinions that go against central and local authorities' decisions and acted intentionally against decisions from the central and local CPC commission. A probe from the commission found Zhao's deeds and words were not in accordance with the central and local Party on significant issues including ethnic separatism, terrorism and religious extremism, the announcement said. Cai Zhiqiang, a professor with the Party School of the Communist Party of China (CPC) Central Committee, told the Global Times that the punishment showed the determination of the CPC to operate with strict discipline and also a zero tolerance attitude on discipline violations. Such decisions and policies are especially significant in Xinjiang, and as a senior official in the media sector, Zhao shouldn't have made public comments recklessly, added Cai. "It is the requirement from Party discipline that Party members should spare no effort to carry out major decisions." 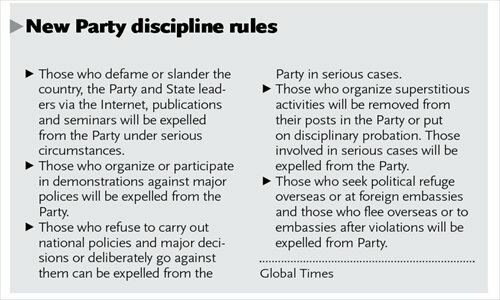 The new Party rules issued on October 21 stipulate that punishment will be imposed on those who irresponsibly make comments about national policies that are damaging to Party unity online or in publications and at seminars. Serious violators will be expelled from the Party. Party members who take the liberty to decide or publicly comment on issues that they have no place to, such as issues that should be decided by the CPC Central Committee, will also be subject to punishment, said the regulation. "The fast and effective implementation of Party decisions needs unity and conformity among Party members, whose voices will be heard and collected via multiple channels before major decisions are made," said Ma Senshu, an official of the CPC Central Commission for Discipline Inspection (CCDI) during an online interview of CCDI's website on Monday. Some Party members kept silent when asked for suggestions but blathered secretly and after decisions were made, which can bring damage to the Party's unity and also hinder the implementation of Party decisions, Ma said. However, the regulation does not mean that dissenting voices in the Party will be stifled, said Deng Lianfan, an anti-graft expert with the Law Society of Hunan Province.